I remember as a child my Grandma telling all of us to sit up straight and to mind our posture. As soon as Grandma walked away I would slouch in front of the TV or where ever I was sitting. I didn't realize just how important my posture was until I started getting a little older. I spend a lot of time sitting at my desk on the computer and it has really began to take it's toll on my back. I have a lot of muscle knots and spasms especially in the area between my spine and right clavicle. I was really interested in trying this Posture Corrector Back Brace to see if it would help or make any difference. The first time I tried it on I noticed my shoulders felt like they were pulled back into a more aligned position. It was comfortable, but I could feel a little tension from my shoulders being put into the position they should be in. The instruction card that is included with the posture corrector says to wear the brace as long as it is comfortable , but not to exceed 30-60 minutes in the first week. After that you should increase time by 15 minutes a day. In the few days that I've been wearing the posture corrector I can already tell a difference. Even when I'm not wearing it I am more conscious of my posture, whether I'm standing or sitting. Realigning my spine is reducing the muscle knots and pain that I've been experiencing. I know that realigning my spine is relieving my pain but I have to build some muscle in my back to keep the alignment straight. 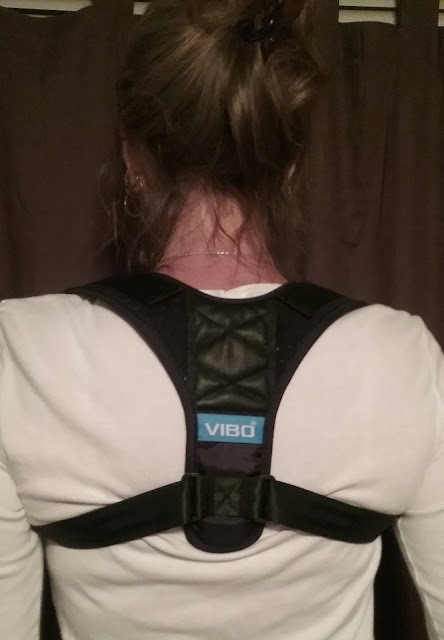 This posture corrector includes VIBO Care Elastic Loop resistance band to help build muscles and prevent pain or further damage. I look forward to eleviating my back pain, building muscle and increasung my mobility using VIBO Care. Easy to keep clean, when your posture corrector needs to be cleaned , simply hand wash it and allow it to drip dry. Do not tumble dry.